Welcome to our 12th (!!) 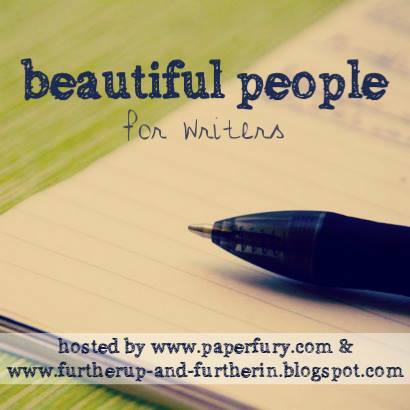 edition of the Beautiful People writers linkup! YAY! We have a friendship-theme going this month in honour of National Friendship Day (August 2nd). OH! And just a little note, but two of my blogging friends Emily and Alyssa have started up a Snazzy Snippets linkup! They give you a theme and you share small snippets of your writing that might fit. It is glorious. So if anyone is interested that, do pop over! Oh oh and another teeny tiny note but…I have been endlessly swamped lately and haven’t gotten a chance to read everyone’s Beautiful People posts. I AM SORRY. So if, when you link up, you can pop by to a few people’s posts and leave some comment love that would be fabulous. ANYWAY! LET US MOVE FORWARDS! 6. Do have any secrets from each other? NOTE: If the button doesn’t work for you then try just saving the image and uploading it your blog and then “linking” it like you would a sentence! It works. Trust me. hello writerlings! it is time for our monthly WRITING UPDATE CHAT! (yay! i love this part!) tell me what you’re working on! are you editing or drafting or plotting something nefariously wonderful??? ALSO: do you like writing about friends?! YAY FRIENDSHIP THIS IS WHAT I’VE BEEN WAITING FOR. I may even use the one I’m going to do for NaNoWriMo this year…just so I can start thinking about it. YOU WERE. BUT NOW YOU FAIL. OMG, FOR SHAME, ELLA. ;-))) Omg, do you have a twitter?!! I COULD NOT FIND YOU ON TWITTER. I was going to tag you but…yes. TELL ME WHOO YOU ARE ON TWITTER SO I MAY STALK FOLLOW YOU. I don’t have twitter…YET. I just sometimes randomly stalk your twitter page. ;’))) I WILL GET TWITTER SOON THOUGH AND YOU WILL BE THE FIRST PERSON TO KNOW. Good questions all. *nods* I’ve actually been super busy lately, so I’ve been cramming reading and writing in around the edges of all this craziness. Consequently, I’m actually still trying to get the second to last draft of my book ready for beta readers, and I’ve been /trying/ to outline some other books (trying, because I am a punster by nature). But I’m not too sad that my book has taken longer, because the way I had the ending felt off, so I’ve had time to figure out why and then (hopefully) correct it. How has your writing/editing been coming along? I’m totally joining in Snazzy Snippets!! I just have been uber lazy about sharing writing online bUT I WILL DEFINITELY SOON!! OH! I have a WIP*, so I can actually participate in Beautiful people for once! The excitement is UNREAL!!! YAY! YOU HAVE A WIP!! *parties quietly with you* I NEARLY HAVE A NEW WIP. I thought I’d take a break after editing but. Um. There is a story in my brain that needs telling. Pfft, dude, I have accidentally skipped MANY beautiful peoples. This is the horror of working on so many secret projects. >_> BUT I WON’T RESIST THIS MONTH BECAUSE FRIENDSHIIIPPPP. Best kind of ship. *whispers* Um, neither have I…I mean, I host it and I NEVER LINK UP. Erk. Although there is a reason, just that my projects have had to stay secret-ish so yesss…awkward. Ah! I’m so glad your stories focus on friendship because those are exactly the kind of books I love to read. 😉 Romance is totally easy to get cliche, I hear ya. And difficult to write. GAh. I must prefer writing friendships. I HAVEN’T WRITTEN A SINGLE WORD IN MONTHS. D; I blame school. 🙁 But I love this week’s topic! I always look for good friendships when I read books, and it’d be interesting to see the friendships being written about by my lovely blogger friends! I’m so excited for this month’s Beautiful People… LOVE IT! YAY THIS IS GLORIOUS NEWS. I’m totally doing this this month, and the questions are friendship, which is perfect. My book is still in the first draft stage, but I’m gonna start edits sometime soon (really) thank you, Cait! Yay! Friendship! I’m so excited about that subject right now because I just finished the second (which was kinda actually third) draft of my book that has a totally wonderful friendship in it. So, I might actually decide to do this one… 🙂 We’ll just have to see because right now my brain is refusing to work properly. I even skipped blogging for two days while I worked on editing which hardly ever happens. Shocking. Anyway. YAY for friendship! I can’t wait to share with everyone more on Amelia and August’s friendship! 😀 I hope to see your Beautiful People post too!! And I have WIP this time too! The happiness I feel in actually having something to work with makes me so happy XD Deffo doing thiss. YES THIS IS IT THIS IS THE ONE THIS IS THE BEAUTIFUL PEOPLE POST I NEED! *whispers* Your comments can’t frighten me, pffffft. And omg, I have asked two people already but TBH I WANT TO JUST LET EVERYONE READ IT BECAUSE I WANT TO KNOW WHAT YOU ALL THINK. But but but yes, I can’t have too many opinions or I will combust. *hangs head in shame* I’ll let you know if I need more betas tho, okay?!! I am working on my current book (the post-apoc coffee shop, heist, crime novel), and I featured a trio of friends (on is my MC). I love writing about friends. A good friendship can tell you a lot about the characters and help with their development (think Frodo and Sam or Harry, Ron, and Hermione). Snazzy snippets sounds like FUN. I’ll pop over at once. This is my first time participating in Beautiful People and I really enjoyed answering these questions and getting to know my characters more! CAAAAAAAAAAAAAAAAAAIT!!!! I want to hug you and Skye and give you cake and party punch! One of my favorite authors read my BP post! She asked for the link to my Wattpad!!!!! Thank you for hosting this feature! OMG OMG REALLY?!! THAT IS INSNANELY AWWWWESOME!!! AHHHH I’M SO HAPPY FOR YOU!!!! I LOVE BOOKS ABOUT FRIENDSHIP. I just finished reading the most adorkable nerdy bookish MG story that is like so lodged in my heart. :’) I like friendship that leads into maaaaybe something more. 😉 FUN.